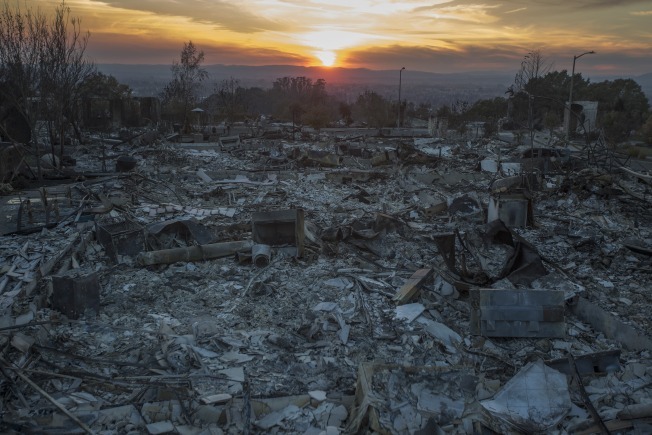 The ruins of houses destroyed by the Tubbs Fire are seen near Fountaingrove Parkway in Santa Rosa. California's 53 U.S. House members requested $4.4 billion in federal aid Friday to help the state recover from its deadliest wildfires ever. That's down sharply from the $7.4 billion originally sought by Gov. Jerry Brown and California Democrats last month. The state lowered its request to the U.S. Department of Agriculture from $3.1 billion to $150 million after a better evaluation of what damage is actually eligible for federal programs, said Kelly Huston, deputy director of the state's Office of Emergency Services. "When the original estimates were made, it was essentially our best approximation of the overall impact," Huston said. "But now, 40 days into the disaster, we know what is covered and where we're at." The 21 wildfires that ripped through Northern California last month were the deadliest in state history. The Congressional letter, meanwhile, represents rare bipartisan agreement among California's delegation. California Republicans initially didn't specify an amount when they asked President Donald Trump for federal relief last month. The new letter with all 53 signatures was sent to the House Appropriations Committee as it crafts supplemental disaster relief legislation. The wildfires destroyed 8,800 structures and 245,000 acres and required 11,000 firefighters to battle the blazes that burned across eight counties. "We are united as a delegation to help our neighbors recover and rebuild from these tragic fires," U.S. House Majority Leader Kevin McCarthy of Bakersfield said in a statement. "These were the worst fires in California's history and, as a result, they left unprecedented damage in their wake," said U.S. Rep. Mike Thompson, a Democrat who represents some of the worst-ravaged areas. "This funding is a vital first step in our long-term recovery." The congressional delegation also asked for targeted tax relief for Californians dealing with fire losses, including penalty-free access to retirement funds, disaster-related employment relief and allowing non-itemized deductions for casualty losses. The agricultural relief money requested by the state would go toward rehabilitating destroyed farm land and watersheds. The original $3 billion estimate took into account future economic and other long-term losses as well as the cost of mitigation measures, Huston said. It's now estimated federal programs can only provide $150 million in the upcoming fiscal year, but the state could ask for more money in the future, he said. Some of the losses may be covered by state programs as well as private and non-profit programs, Huston said. "The federal programs are a major part of the recovery, but it's not all of the recovery," he said.